May 2014 saw us undertake a rather special road trip in our 2008 Opel GT. Our trip consisted of 5 nights in the South of France at Port Cogolin, 4 nights in Brescia, 3 nights in Venice and 4 nights in the Dolomites in the South Tyrol region. On this trip we were watching the Monaco Grand Prix Historique and the famous Mille Miglia race from Brescia to Rome and back. Finally we were meeting 9 other car enthusiasts in the Dolomites who also had Opel GTs to do some driving and exploring of some passes in the Dolomites. It proved to be a simply marvellous holiday and you can read the full holiday diary on our sister site PhotoBeast here. 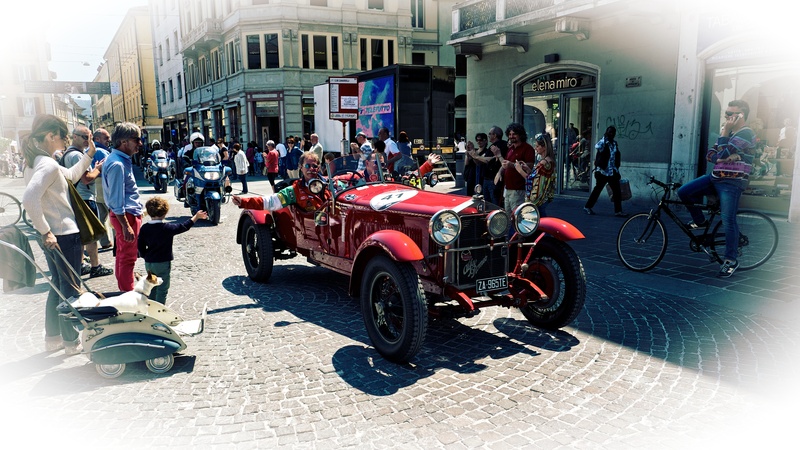 Here though are some photographs and recollection from our time in Brescia watching The Mille Miglia. This set of photographs are some from our fourth day there, when the racers returned to Brescia after their epic 1000 mile drive. After a lazy morning we opened our blinds to another beautiful day and today we wanted to get back into town for 11.45 for when the Mille Miglia Piloti returned. As we got into Piazza Duomo the tables we had seen last night were now all laid out for lunch and the tented kitchens were busy cooking. We were trying to make out from which direction they would come back in but as all the stewards were wandering about in vague Italian style it was almost impossible to guess. A visit to the Chopard stand, with a few overt checks of the time on my Chopard watch blagged me a Chopard cap, but the aftershave I really wanted was reserved for race participants and they just would not sell them at any price. 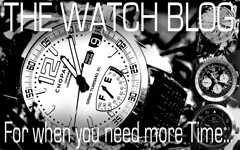 I think Chopard missed an opportunity there as I think they would have sold loads of them. Eventually, we decided the race drivers couldn’t come through this piazza as it was full of tents and with nowhere to go, they couldn’t parade through the town like they did when they began the race, as that bit was all set out with tables and chairs again just as it usually is. So the only place left was Piazza Vittorio and there did seem to be a few more stewards there than anywhere else. 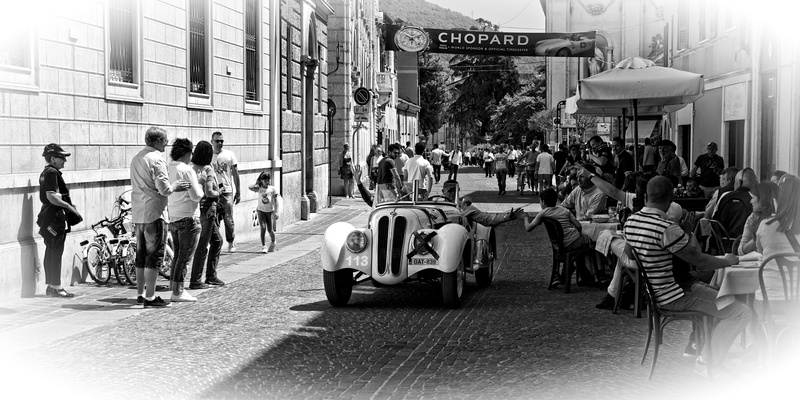 It was strangely quiet for quite a while after 11.45 but eventually we heard that familiar rumble of vintage cars through old narrow streets and the first drivers arrived to a cheer. We found out later when we followed their trail, that of course the finishing line was on the same raised plinth they had set off from, right on the other side of town, and then when they had finished they stopped all over the place to meet friends and relatives, drink champagne, phone their mates and do all the other essentials of life. We mixed in amongst them as we did at the start of the race and let the jolly atmosphere rub off on us. It really was fun and hopefully when we get back home we will have snapped one or two good photographs to remember this by. When they had calmed down the drivers jumped back in their cars and paraded through the town again, often with mates perched in odd places on the backs of cars all waving wildly as they were cheered past every bar and restaurant. We also had lunch in a restaurant by the roadside and joined in the cheering as the cars tooted and roared by, in between mouthfuls of pizza! Finally the cars ended up back in said Piazza where in the end they were all parked up. It made me smile that they were all given a metre square piece of card to catch the oil leaks so the Piazza didn’t get spoilt and indeed there were many leaks in many places, and the Piazza will still need cleaning! We picked up a few more souvenirs including a MM race book which would be fantastic if we understood Italian, maps, t-shirts and scarves but stopped short of nicking the MM banner that was attached all round the barriers, although many richer than us didn’t demonstrate such scruples. As the afternoon passed the cars and drivers slowly disappeared and by 7pm Brescia was back to it’s normal self, it’s four days of glory over for another year. After changing and freshening up at our hotel we had a meal in town and it seemed impossible that only the night before the town was heaving with people, bustling with an atmosphere the like of which I don’t think I have seen before, with all the restaurants full to busting, and tonight it was deadly quiet. 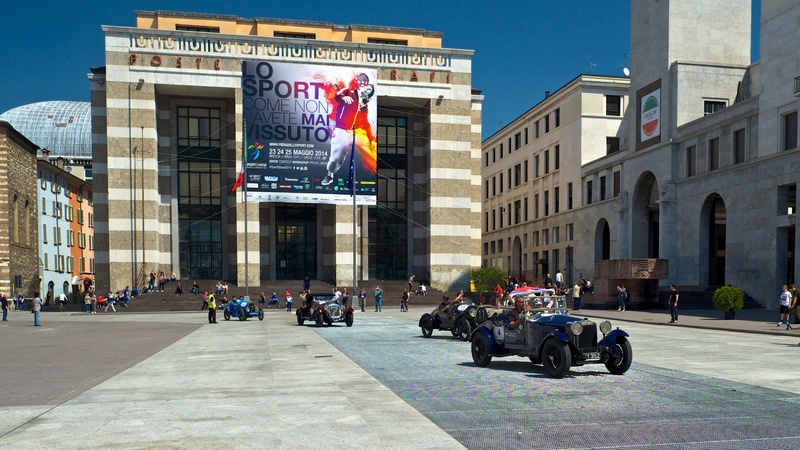 So that was it, the wonderful spectacle that is The Mille Miglia was over for another year. If you ever get the opportunity go and watch it, it really does amaze you. We were sad that it was over but luckily we had a cunning plan to cheer us up – tomorrow we were heading off for Venice for three days of relaxing in that beautiful city. Hate me don’t ya just! Categories: Car Blog, Car Events 2014, Mille Miglia 2014, Opel GT Blog, Road Trips | Tags: Brescia, Mille Miglia, Mille Miglia 2014 | Permalink.